The Baldur's Gate 2: Enhanced Edited will be adding more than 350,000 words of text to the game. When the Baldur's Gate: Enhanced Edition was first announced, the excitement among many fans was palpable. Aside from giving them another excuse to play an old favorite, the new version promised a revised interface, new characters and content to expand on the game's already massive experience. While the iOS version suffered from some porting issues, the PC version offered some nice tweaks to help the game shrug off some of its more archaic facets. All in all, it was a nice re-release. Some were quick to note, however, that the Enhanced Edition's refinements were, in some ways, inferior to what modders had already accomplished, leaving gamers to choose whether or not it was worth investing in the new version when the original, with a bit of elbow grease, could potentially be better. Perhaps recognizing this issue, Beamdog, the publisher behind Baldur's Gate: Enhanced Edition, has been working hard to ensure to ensure that Baldur's Gate 2: Enhanced Edition is, unquestionably, the best version of the game. One step being taken is substantially expanding on the game's story. "We're hard at hard on BG2: EE," said Trent Oster, president of Beamdog. "Phil (our design lead) mentioned to me there is over 350,000 words of new content." 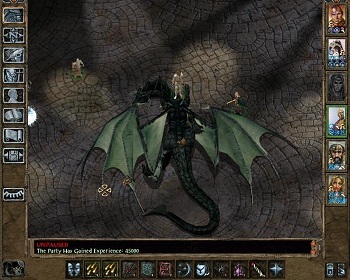 The extra word count will take the form of quests and additional story details that takes place across the course of Baldur's Gate 2 and its expansion Throne of Bhaal, which will be bundled with the PC and Mac versions of the Enhanced Edition. Needless to say, that much extra writing is pretty impressive and, if it's well executed, could definitely help the Enhanced Edition of Baldur's Gate 2 be the version to pick. That said, one of the thing's Baldur's Gate 2 is primarily remembered for is its story, so Beamdog takes a risk in tinkering with the element many fans love the most.